I’ve always enjoyed the cold. Watching snowflakes fall is so peaceful and there is nothing better than coming in from outside to a cup of hot cocoa. When I found a cheap flight to Tromsø, I booked it that same day. Tromsø is a quaint little town in the arctic circle and it is super walkable. Everywhere you look, you’re surrounded by colorful Nordic architecture, cute little houses with candles in the windows, and giant fjords. Everyone I encountered while I was there was so friendly and helpful, I would move here in an instant. I went on a northern lights chase two of the nights in the city. I was lucky to catch them on my second night. Seeing the aurora borealis was one of the most amazing sights I have ever encountered in my travels. 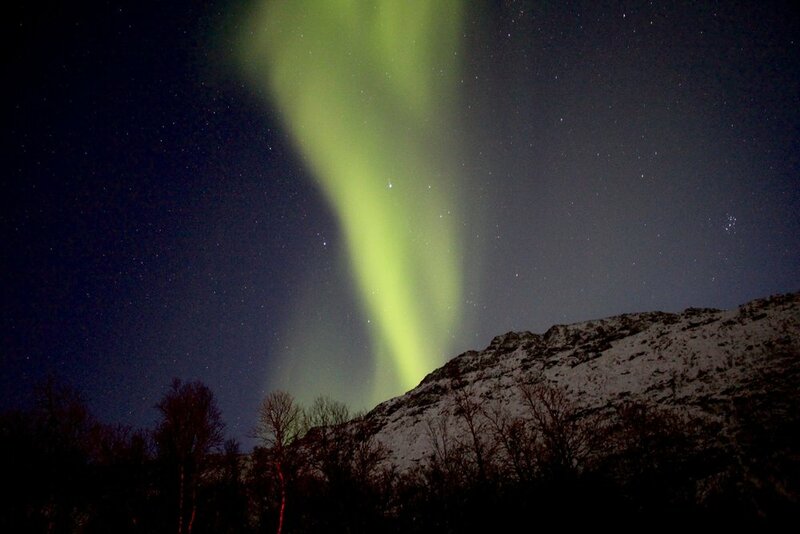 If you ever visit Tromsø and want to see the lights, I highly recommend going on an actual guided chase. I met several people that attempted independent chases and ended up not seeing anything. I booked my tour with Dan Steinbakk of Arctic Experience Tromsø. Dan is one of the friendliest people you will ever meet — he loves his job and you can tell. He also has an 8-person cap on all tours, which makes for a more intimate and enjoyable experience IMO. The first night I arrived, I went on my first chase with Dan. The skies were pretty cloudy, but Dan thought he might be able to find a clear spot for us. Our group consisted of an older couple from England, and a couple and their two children from a small town in Iowa — about an hour and a half from where I grew up. Side bar: it’s always surprising to me how you can be halfway around the world and meet people from your general corner. We drove and drove and made multiple stops, but the sky just was not clearing up. Dan apologized and told us that he would take us all out the following night for no additional charge. The older English couple and I were down! Dan picked me up at my hotel again and off we went. The skies were super clear and everyone was feeling optimistic. Dan drove us to a beautiful clearing surrounded by fjords and started a fire. While we waited for the light show, Dan told us stories about living in Tromso and fed us hot cocoa, soup, and cake. I was in hygge heaven. Suddenly, we started to see faint streaks of green coming over the fjords. As we squinted, the streaks became clearer until a thick current of green light danced across the sky. The current was running quickly, but the movement was so gentle and and rhythmic. At some point, Dan grabbed a camera and told us to start snapping photos. Luckily the photo shoot only lasted about ten minutes and we were back to just standing by the fire with our heads pointed to the sky. Every now and then, we’re lucky enough to encounter something in nature that is truly awe-inspiring and humbling. This was one of those encounters for me and an experience I will never forget.